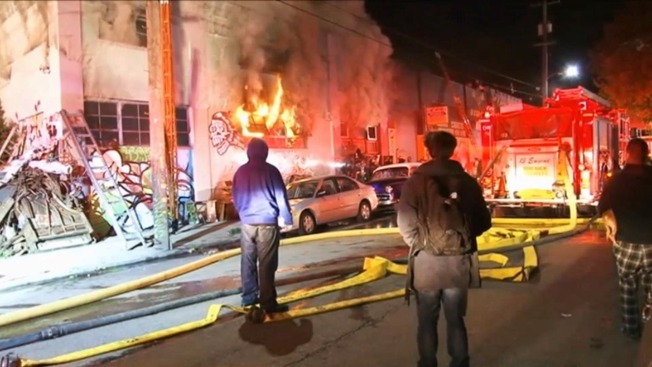 The city of Oakland started investigating nearly three weeks ago whether people were illegally living in a warehouse destroyed by a fire late Friday night. At least nine people died. Darin Ranelletti, of the City of Oakland Planning Department, says the city had received reports of people living illegally in the building, which was only permitted as a warehouse. They opened an investigation on Nov. 13. He says an investigator went to the premises on Nov. 17 but could not gain access to the inside of the building. Ranelletti says they had not yet confirmed people were living inside. Photos posted online of the warehouse - called the "Oakland Ghost Ship" - showed pictures of a bohemian, loft-like interior made of wood and cluttered with beds, rugs, old sofas, pianos, paintings, turntables, statues and other items. Neighbors had complained of trash piling up outside the property and concerns the garbage posed a danger, according to the city's Planning and Building Department website.